ASK anyone living on the Atlantic seaboard, and they will have a story about Shannon airport. It is the setting for some of the most dramatic moments in the West of Ireland life. We’ve all begun adventures there, and ended them, and we’ve all cried there – waving someone off, not knowing when we’ll see them again, or welcoming someone home forever, in a casket. That’s one of the reasons why the decline of Shannon is so sad. This is not just another of those silly commercial airports that sprang up needlessly all over the country and are now surplus to requirements. This is not some glorified field in the boondocks. This is Shannon, Ireland’s first transatlantic airport. Charles Lindbergh, no less, was instrumental in its foundation. This week, I tried (unsuccessfully) to get a flight out of Shannon to anywhere interesting. You can get to Puerto Rico, but that’s as exotic as it gets. You can’t even fly to Dublin from Shannon any more (not that Dublin qualifies as interesting to anyone outside Dublin). The feeling of raw nostalgia was almost painful, because there was a time when you could get to Havana, or Moscow, or Luanda, by boarding a flight there. When the first Aeroflot flight landed at Shannon in September 1975, the captain was presented with an Aran sweater. Witnesses say there was a brass band to greet the flight as it landed. The chief stewardess, who looks a little embarrassed in the photos, was given a nice bit of Waterford crystal. This was the middle of the Cold War. America was aghast, but that didn’t bother Shannon. 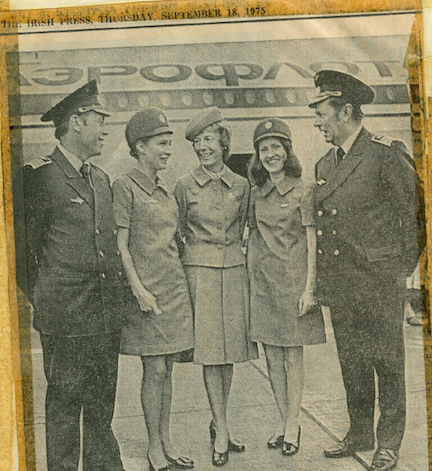 Throughout the 1980s, while relations between the USSR and the United States got progressively worse, Aeroflot breezed in and out of Shannon without a diplomatic care in the world. This was a neutral country then. Shannon was once run by enterprising, spirited people who were unwilling to let the airport decline simply because the jet age had made refuelling there unnecessary. Now it’s run by the Dublin Airport Authority. Enough said. The clue is in the name. But the most brilliant wheeze for drumming up revenue at Shannon was undoubtedly the fuel deal with Aeroflot struck by the airport’s chiefs, Liam Skelly and Michael Guerin, in the late ’70s. Under the deal, Aeroflot avoided the energy-crisis cost of aviation fuel by storing its own fuel at Shannon. With Aeroflot’s agreement, Shannon then began selling Soviet fuel to other airlines. In an interview in the Moodie Report publication ‘The World Rovers’, Guerin described how tense things became after a Korean Air passenger airliner was downed by the Soviets in 1983. “Not long after the Korean Air tragedy, we had a US military transport coming through to refuel. They were parked next to an Aeroflot jet, and the US personnel were shouting abuse over at the Russians about their terrible regime, and their awful country. The irony was that they were being refuelled by Soviet aviation fuel supplied by Aeroflot,” he recalled. Shannon is now better known as an American quasi military base. After the US invaded Iraq, you were always elbow-to-elbow, airside, with juvenile American soldiers who inspired as much pity as resentment. And it’s now losing €8m a year. But despite its intriguing past and lamentable present, Shannon has always been an easy-going, mannerly place. Lately I parked my car in the set-down area, ignoring the signs warning me it would be towed. Sure enough, ten minutes later I heard my registration number over the PA system, and a command to return to the vehicle immediately. An anxious-looking steward was standing beside my car. “You left your lights on,” he said. If you have to emigrate, that’s the sort of place you want to leave from. That’s the sort of place that would make you want to come back. That’s why we can never be asked to do without Shannon airport. ONE of the first skills you learn in journalism – that is, if you learn journalism the old-fashioned way (but more on that in a moment) – is how to make a story out of nothing. ‘Man Bites Dog’ may be the conventional test of newsworthiness, but in the provincial press, ‘Dog Bites Man’ is what your readers want. It would be a serious dereliction of duty to let a bitten man go unreported – but only if he’s a local bitten man, naturally. Dogs (and men) from far-flung counties can do all the biting they like. Provincial newspapers are continuing their steady decline, according to the latest ABC figures. Readership is falling at almost all of the regional titles, with the eerie exception of the Roscommon Herald, whose circulation has risen 0.1%. This means the Roscommon Herald gained approximately 8.6 readers last year, but don’t mock it till you try it. Losing eight readers would be a calamity; gaining eight readers is just local news at its best. So once again we’re contemplating a world without a regional press. It’s unthinkable. How would you find out who won the handball, or when Brendan so-and-so was retiring, or which daughter of the parish died outside in America, or when there was a cake sale, or which county councillors were pressing for new road markings? Where else would you go to find brilliant photojournalism illustrating comically substandard reporting? Where else to see the word ‘refute’ misused so often that eventually lexicographers, their spirits broken, will have to allow it to mean ‘deny’? What if you’ve clean forgotten to return your sheep census forms and there’s no local paper to furnish the helpful headline: ‘Farmers Urged to Return Sheep Census Forms’? What if an old industrial gas cylinder is washed up by the tide, and there is no local paper to fly into a hysterical panic and scream ‘Bomb Found On Lahinch Beach!’? Until recently, provincial newspapers also supplied another useful service, which was the training of journalists. Nowadays, people seem to pick up enviable jobs in the national press equipped with nothing more than a rinky-dink “Master’s” in journalism and a record of vanity blogging. Young people today, grumble, grumble. But there was a time when no career in journalism began without the proper initiation rites, such as covering district courts (where you learn everything worth knowing about human society), and of course council meetings. You weren’t a proper reporter until the expression “I’d like to be associated with those remarks” had begun to sound almost normal. Drunk with nascent power, you punished councillors you didn’t like by not associating them with those remarks in print. Flinty stares were exchanged in civic offices. In the past, of course, local newspapers tended to be owned by well-dressed local families, with idiosyncratic editors who, in the fine tradition of the Skibbereen Eagle, “kept an eye” on things they had no business keeping an eye on. But during the boom era, bloodthirsty media conglomerates began forking out millions for parish newsletters in every two-horse townland in the country. (Yes, slight exaggeration is another art that you hone in the provincial press. Thank you for noticing.) So now your local paper is likely to be a mere nag in the stable of some glass-and-steel corporate monolith many miles away. In contrast, I worked for a time in a rat-infested building in Cavan, for a tiny newspaper that’s long since gone. Cavan is a place where people’s acute sense of – well, let’s call it privacy – makes it almost impossible to get any journalism done. I was once despatched to interview an elderly woman who had won first prize in a knitting competition. Having introduced myself and explained my business, I began my inquiries. “No comment,” she said. This is what you’re up against as a regional journalist. The first provincial newspaper editor I ever worked for, Jarlath Burke (pictured), late editor of the Tuam Herald, would bellow furiously at you for making a grammatical error, but was forbearing to the point of tenderness when you made a complete dog’s dinner of the story and all but libelled somebody. This is because everyone has to learn the craft of journalism, but if you don’t already know your own language there’s no hope for you. You never forget these lessons, even years after being superannuated as a reporter. You store teetering piles of notes (in shorthand) in a cupboard somewhere, long after the statute of limitations has kicked in for the Defamation Act; you can’t break the habit of disbelieving everything you’re told; you keep your long-dead first editor inside your head as a precious inner critic; you understand that everything – literally everything – is of interest to someone; and you uphold a studied indifference towards old ladies who knit.